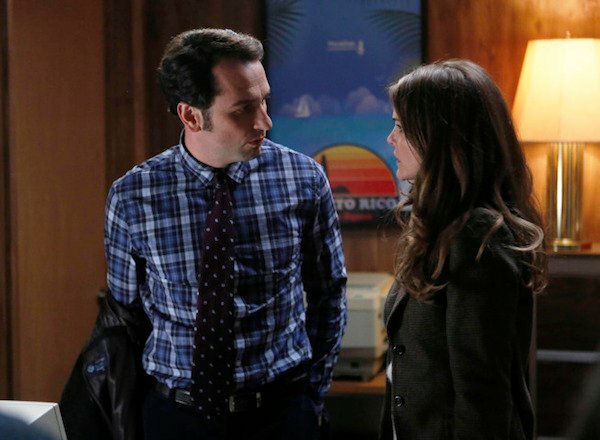 If you can get past Philip’s plaid shirt/spotted tie combo, you’ll see Matthew Rhys’ character having what might be a tense moments with his wife Elizabeth (Keri Russell). Or maybe they’re just chatting. It’s hard to say what’s going on here. Currently in production in New York, The Americans is a period drama about the complex marriage of two KGB spies posing as Americans in suburban Washington D.C. shortly after Ronald Reagan is elected President. The arranged marriage of Philip (Rhys) and Elizabeth Jennings (Russell), who have two children – 14-year-old Paige (Taylor) and 11-year-old Henry (Sellati), who know nothing about their parents’ true identity – grows more passionate and genuine by the day, but is constantly tested by the escalation of the Cold War and the intimate, dangerous and darkly funny relationships they must maintain with a network of spies and informants under their control. Their neighbor, FBI Agent Stan Beeman (Emmerich) has already come dangerously close to discovering their secret, but was thwarted by Nina (Mahendru), his KGB mole and paramour. Torn between his wife Sandra (Misner) and his deepening feelings for Nina, Stan is completely unaware that the beautiful Russian is actually a double agent, reporting on him to the KGB. Philip has been more successful handling his mole within the FBI, Martha (Wright), assistant to Stan’s boss, Special Agent Gaad (Richard Thomas). Romancing Martha under the guise of one of his cover identities, an FBI bureaucrat named “Clark,” Philip has secured her unquestioning loyalty…by marrying her. Meanwhile, in the Jennings’ house, Paige has become increasingly suspicious that her parents are hiding something. The Americans was unfortunately overlooked for this year’s Golden Globe nominations. I would have thought Keri Russell would have earned herself a nomination. Maybe next year. View the full list of Midseason premiere dates here.